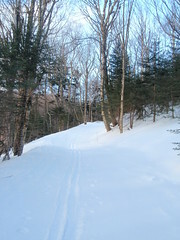 Bolton is a great place for families to enjoy winter, play outside and and explore the woods. 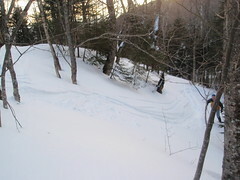 We have ski and snowshoe rentals for both adults and kids. There is also plenty of space at the Nordic Center located in the Sports Center building to stash gear, have lunch, relax with family and hang out with kids. 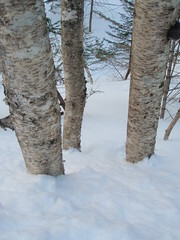 And when you are done skiing come inside for a hot drink and share the stories of your adventures. The Bolton Valley Nordic Center will be offering a multi week kids Nordic program. The program is open to kids between the ages of 6 and 12, and it focuses on the development of basic Nordic skiing skills as well as natural science and orienteering lessons. 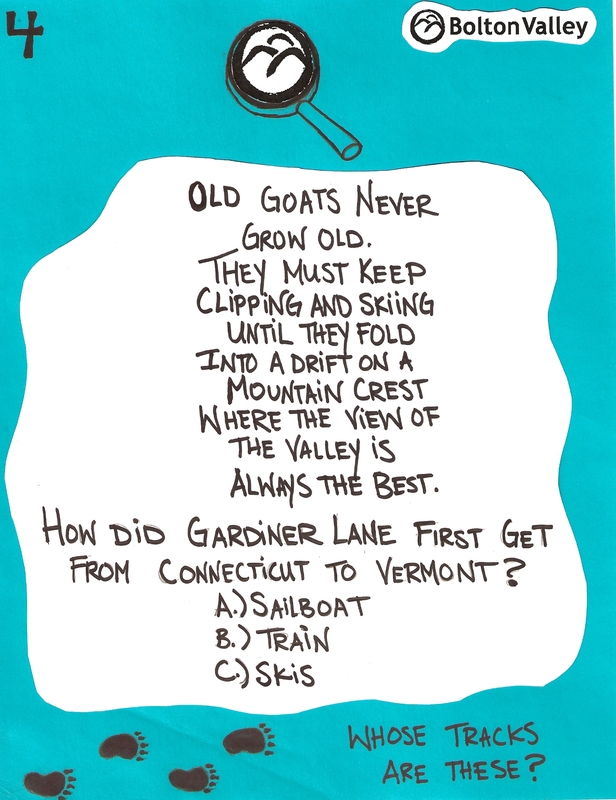 We will explore the extensive trail system of Bolton Valley using Adventure Quest Poems as our Maps. At the end of each Quest we will test our Nordic skills with fun games like ski soccer and tag. Kids 6 and under receive complimentary tickets at Bolton, so they do not require tickets for this program. Kids 7 and over do need to have tickets or a season pass. One of the waypoints in our new scavanger hunt. Go exploring on your skis! Grab one of the Scavenger Hunt Maps in the Nordic Center and track down the waypoints that we’ve stashed out in the woods! Answer the trivia questions or identify the animal prints at each point to prove that you found it, then check back in with the Nordic Center Staff to confirm your answers and get a stamp for your accomplishment. Look for our display to get your map and poem. designed to get kids and families skiing in a fun, creative way. 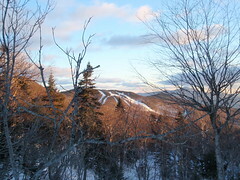 We have created a poem and map for both beginner and intermediate skiers. The adventure begins when you pick-up your map at the Nordic Center, put on your skis and start reading the natural history clues in our Nordic Quest Poems. Beginner Poem-Directions and on this page you will also find a link to the map. Intermediate Poem-Directions and on this page you will also find a link to the map. 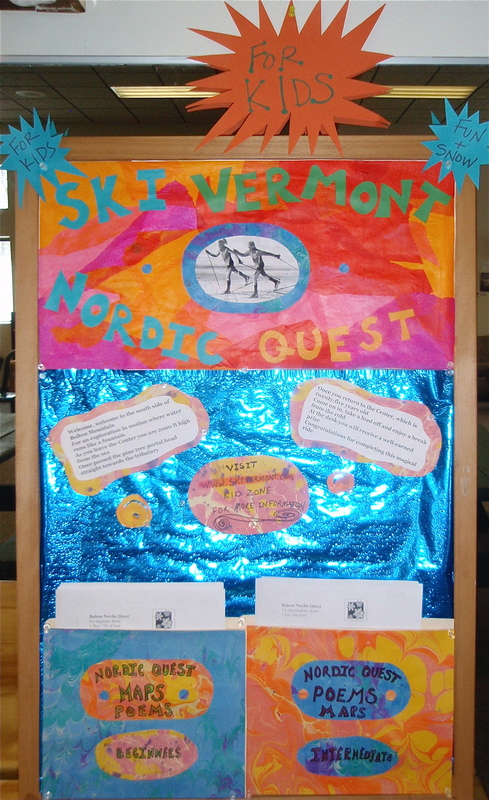 Other great Kids programs from Ski Vermont— Check out these links for more information. Pingback: UVM » Blog Archive » Bolton Bill Koch Day!